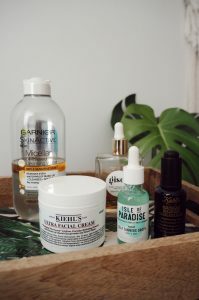 Skincare is one of my favourite things; I’ll dabble in beauty products but for the most part, I’ll use what I know and stick to it, but when it comes to skincare I’m happy to try new things and I’ll always be on the search for the best. 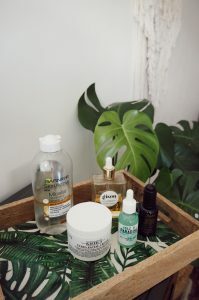 Blogs are the best invention for people who are intrigued by skincare because it doesn’t matter what’s written on the blurb or how they describe it in the adverts, it’s all about peoples long term experiences and for this kind of honest and organic opinion, what better way to scroll through blogs and pick up some new favourites. Now, that being said I have often struggled with my own skin type as I have no issues with oil whatsoever and very little issue with breakouts, but I have incredibly dry skin to the point it’ll flake off during the day and also I’m very pale, and there’s not masses of products out there aimed at us people. I’ve been using the same few products now for circa six months and I feel like I’m now in a good place to give some reviews back. Let’s start with my morning routine; I do keep my skincare as minimal as possible but I do still have a few products which are purely morning or evening based. For the morning, I rinse my skin with the Glossier Milky Jelly Cleanser. I got this at the start of the year and I’ve been working my way through it. It’s good, it makes very little difference but it doesn’t dry my skin out so it’s a winner in my books. I would buy it again but I’d also happily stray away. 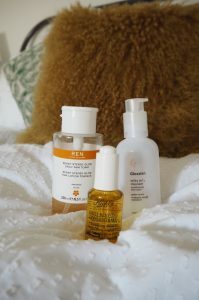 Post cleansing, I use the Ren Ready Steady Glow AHA Tonic. I picked this up when I had a glow tonic shaped hole in my skincare and I’d tried the Pixi Glow Tonic before so thought I’d give it a go. I love this product, not that it matters in the grand scheme of things but firstly it has brilliant packaging. The product is dispensed through a pump which you place your cotton pad on top of and go from there. I wipe this across my forehead, chin, heavily around my nose and on my temples as I tend to get blackheads here. The AHA Tonic brightens my skin in the short term and the long term and after use I feel very fresh and awake. 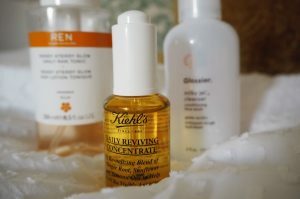 Following on from this, I use the Kiehls Daily Reviving Concentrate as my oil to add hydration. Using an oil under my make up makes my skin feel comfortable through out the day as it keeps it plump and flexible without drying and flaking throughout the day. 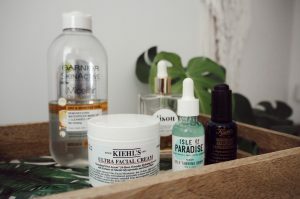 I am a big fan of Kiehls and have been for a while now, I definitely will come back to this oil although I do think this little pot will last a while! Moving swiftly onto my evening routine – now I don’t want to sound like a nagging aunt or a broken record but about ten months ago I stopped using face wipes and OH MY GOD what a difference. I heard people saying this for years but the ease of using a face wipe just stopped me from doing the right thing. I now use the Garnier Micellar Water and am currently opting for the oil based version for obvious reasons and I really enjoy it. It’s sensitive enough for my eyes but dreamy at removing make up and also leaves my skin super soft. 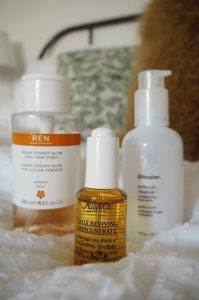 Once I’m make up free, I use the evening version of my Kiehls oil, this time the Midnight Recovery Concentrate which is the perfect partner to work it’s overnight magic. I follow this up with my Kiehls Ultra Facial Cream which is a lightweight moisturiser and it soaks straight in making for a comfortable night sleep without worrying my moisturiser is soaking into my pillowcase instead. A slightly newer fellow to my nighttime regime is the Isle Of Paradise Tanning Drops, like I said before, I am very pale and I’ve been giving these little honeys a try. They are very good, I mix two small drops into my moisturiser and by morning I just look healthier. The only thing is it freaks me out a little as it comes off when using my micellar water and makes it seem like you just can’t get your skin clean! Now not a skincare item but I also wanted an honorary mention to the fan-tab-ulous Gisou Honey Infused Hair Oil. I am a fan girl to the extreme for Negin and her brand, Gisou. I run about four drops of this through my ends and it leaves my hair so incredibly soft the next day. I will do a full review on this soon but basically, buy it! "Five Things I Learnt When Renovating"
"Five Life Lessons I Learnt From The Hills"